Hello, followers of my weekly email. I have missed the past couple of weekly communications. I thought that you had more important things to do such as; last minute Christmas shopping, being with friends and family and welcoming in the new year. Rather than reading my words of wisdom and my tales of adventure. As most of you know, in December, Ali and I went cruising along the Mexican Rivera. We visited Cabo San Lucas, Mazatlan, and Puerto Vallarta. This cruise was our second trip to the area, and we enjoyed these seven days and the weather, mostly, was great. After our cruise was over, we drove up the coast, stopping in Santa Barbara for lunch (along the Pacific Coast Highway – gorgeous), then up to San Luis Obispo where we visited the famous Madonna Inn, and it’s legendary men’s room (that story is for another venue). The first day in San Francisco, our ultimate destination, we parked and walked what felt like 10 miles around the Wharf, returning to our car in a steady cold drizzle. Well, of course, yours truly came down with a heck of a hacking cough (thanks Ali who refused to take a taxi or even UBER – cheap). I still have it, and I am on heavy meds, but things are looking up, and I am feeling better. This is my first full week in the office in over a month, and I can tell you, I can get used to short work weeks! I am sure my staff like it when Ali and I are gone (cats away, mice playing and all that). However, it is now the beginning of tax season, and we are in the throes of year-end payroll. I even prepared a couple of business tax returns. We can only prepare the returns, but not e-file them, yet. Business returns can be filed effective January 8th, but not e-filed until January 11th (so far). The IRS announced on Monday that individual tax returns could be paper and e-filed on January 28th. If you are one of my many self-employed clients or landlords, or are a partner in any partnership (even if it is just as an investment), a member in an LLC or a shareholder of an S-corporation, your return has become much more complicated, thanks to the new Qualified Business Income (QBI) Deduction that was part of the Tax Cuts and Jobs Act or TCJA which was passed on December 22, 2017. Even if you find yourselves not itemizing your deductions due to the higher standard deduction, but you happen to be lucky enough to have QBI over a certain threshold, “Oye Vey” (as my nanny used to say). I have spent over 50 hours studying just this part of the new TCJA. So, for my business owner clients, if we do not perform your bookkeeping services, please get those numbers to us so we can get started sooner rather than later. For our monthly write-up clients, please send us your missing information ASAP. You may have read that the pundits and experts (including yours truly) have concluded that many taxpayers will not be happy with the results of their tax return this year. So the sooner you get your paperwork in, the sooner we can see if we can make adjustments for 2019. One last thing – even with the government shutdown, notices for taxes due are still being sent to taxpayers. Most IRS notices are computer generated, and the IRS computer does not get paid, so they are still up and running (just not the IRS fax machines). Please do not ignore these letters and notices. 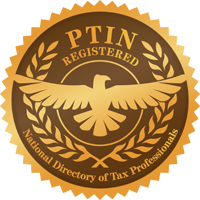 Did you know that many tax experts may not be tax resolution experts, like moi?